This free double crochet circle pattern does more than just teach you how to crochet a single circle. It also shows you how circles are built in crochet. Therefore, if you follow this pattern, then you will learn what you need to know to crochet flat circles using almost any basic crochet stitch. As you will see, there is a simple formula that you can follow when crocheting in the round so that you get flat circles rather than ones that buckle after a few rounds. The key is to increase the right number of stitches in each round. While there are many ways to do this, there is also a very common way for working with the basic stitches (such as single crochet, half double crochet, and double crochet circles). In this tutorial, you'll learn how to create a simple double crochet circle. You can make a circle of any size by following these instructions because you will learn exactly how to increase in each round. This will also give you a foundation for learning how to crochet similar circles in other stitch patterns. Chain 3. You will then work your next stitches into the third chain from the hook. Chain 3 and slip stitch together. You will then work your next stitches into the center of the ring you have created. Crochet a magic ring. You will then work your next stitches into the center of the ring. See step one of How to Crochet A Circle for more information on this. So what are these next stitches? They are your first round of double crochet stitches. You can crochet as many as you would like to start with. For example, you could create a relatively small center with four double crochet stitches. In this example, we are going to make ten double crochet stitches for our first round. Then slip stitch to close the round. So, at the end of round one in our simple double crochet circle pattern, you have ten double crochet stitches. In round 2 of your double crochet circle, you will crochet 2 dc stitches into each of the stitches from the round below. If, as described in step one, you began with 10 dc stitches, then you're going to end this round with 20 dc stitches. Notice that in round 2, you are creating sets of 2 stitches (10 sets of 2 stitches). Note that in order to begin your round, you must first chain three. This counts as your first double crochet stitch. You will then crochet your second double crochet stitch into the base of that same chain 3. That's your first set of 2 dc stitches. You will 2 dc in each stitch around. Slip stitch to join at the end of the round. In round 3 of your double crochet circle, you will make one double crochet and then in the next stitch you will create two double crochet. So, to recap, step 3 of your double crochet circle pattern is chain 3 (counts as your first double crochet) then 2 dc in next stitch. *1 dc, 2dc. Repeat from * around. Slip stitch to join. 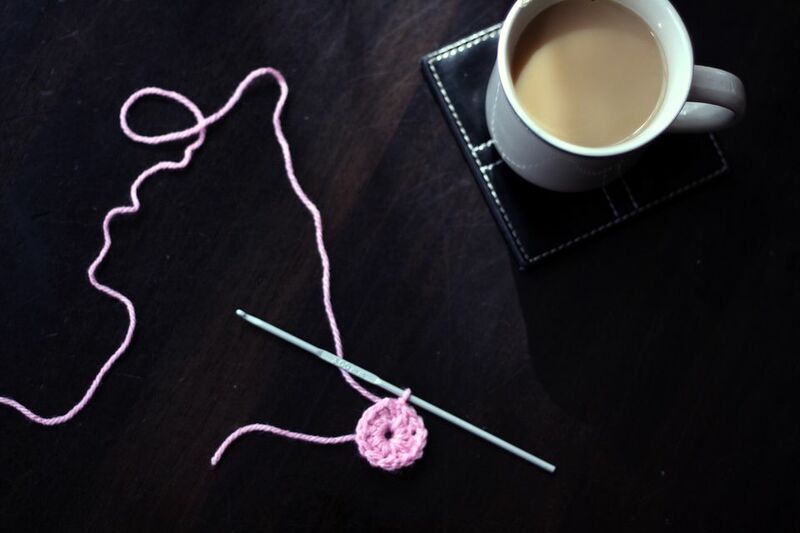 In round 4 of your double crochet circle, you will make one double crochet, then one double crochet in the next stitch, then 2 double crochet in the following stitch. So, again, notice that this is round 4, and you are creating sets of 4 stitches. 1 dc, 1 dc, 2 dc. You'll repeat that around. So, to recap, step 4 of your double crochet circle pattern is chain 3 (counts as your first dc), dc, 2 dc. Then *1 dc, 1 dc, 2 dc and repeat from * around. Slip stitch to join. Following our simple mathematical formula described at the end of step 3, we are in step #4 and 4 multiplied by our starting # of 10 stitches means that you will have 40 stitches at the end of round 4. 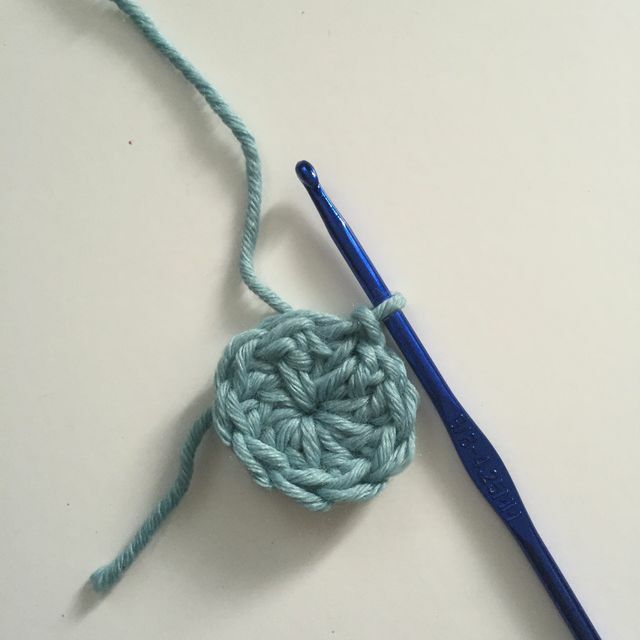 You should be getting the hang of this circle by now but we will do one more round to make sure that you know how to make a double crochet circle. So, it's round 5, and you need to create a set of 5 stitches. This is done by adding one more dc before the dc increase. In other words, you will now do 1 dc, 1 dc, 1 dc, 2 dc. Repeat that all the way around. So, to recap, step 5 of your double crochet circle pattern is chain 3 (counts as your first dc), dc, dc, 2 dc. Then * 1 dc, 1 dc, 1 dc, 2 dc and repeat from * around. Slip stitch to join. You will end this round with 50 double crochet stitches. Now that you have the pattern down, you will be able to keep increasing your double crochet circle. ​Round 6 will be a repeat of 1 dc in 4 stitches then 2 dc (for a total of 6 stitches). You will end with 60 dc stitches at the end of this round. Round 7 will be a repeat of 1 dc in 5 stitches then 2 dc (for a total of 7 stitches). You will end with 70 dc stitches at the end of this round. Continue accordingly as large as you want to go. Here is a crochet mandala pattern that shows you 12 rounds of these simple double crochet increases. You will notice if you look at the photo here that each increase should happen in the increase of the row before.